I’ve found myself thinking about this question a lot lately. In high school I was always the, tell-it-like-it-is, never sugar coat anything, be honest even if it hurts, type of girl. In my head that made me real. Being unafraid to speak up made me authentic. Even if what I said hurt someone else. In college, I softened up a bit. I thought authenticity meant honesty, but not to the point of hurting someone's feelings and only when called upon. Being true to your values meant you were authentic so on top of being honest, I also had to be trustworthy and true to my opinions and beliefs. Now, as I reflect on authenticity my definition has changed yet again. Authenticity is more than your values, telling the truth, or talking about your opinions. Those things are important, but they lack the one true quality of authenticity. They don't relate to listening to your inner voice and taking action. It’s not just knowing your values, but living your values, it’s not just telling the truth but telling your truth, and it’s not just staying what you think is right, but standing up for it. 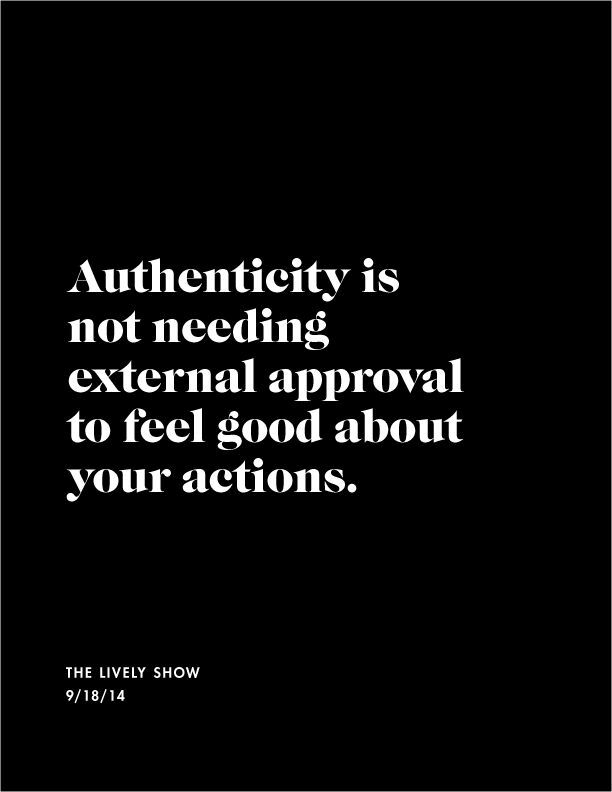 Being authentic is an action. We all have a different idea of what it means to be authentic. The values that I think are virtuous might not be the same values you think are important. That’s great! That doesn’t matter, there is no right or wrong answer here. If you are living and abiding by your core values you are being true to yourself. The only person you have to be real with is you. That is the connection between self-awareness and authenticity, you have to know yourself well enough to say, "I am aligning my life with my values". Let me tell you, it’s easier said than done. I have always felt authentic. In high school, in college, I have always reasoned with myself, the many ways, that I am genuine, even more genuine than other people! Looking at my life now, I know, that I was wrong. If I was being real with myself this whole time, I never would have stayed in a relationship that I was unhappy in for 3 ½ years, I never would have waited so long to write my blog over fear of what people would think, I never would have done a lot of things. If I was being true to my inner voice, I would have made different choices. The difference between now and before is I am self-aware and understand my values and the ways that I am not being true to them. Ask yourself these questions to determine if you are being true to your character. 1. Do I clearly hear and always listen to my voice of intuition? 2. Can I name my 5 core values without much or any hesitation? 4. Are my values fully integrated into my life, do I live them every day? 5. Do I know what inspires and motivates me on a daily basis? 6. Do I know what habits I can change to improve my life? 7. Do I use my natural gifts, talents, and am passionate about the work I do? 8. Are the activities I do daily, aligned with my goals? The key to listening to your inner voice is having the courage, knowledge, and self-acceptance to hear your inner thoughts as truths. Once you begin to listen to that voice your self-awareness will be more fined tuned. You will find it easier to align your life with your values and you will care less about other people's opinions and thoughts about you. That voice never produces self-doubt, insecurities, or negativity, so make sure you ignore those voices. With self-acceptance you will find authenticity in your life.